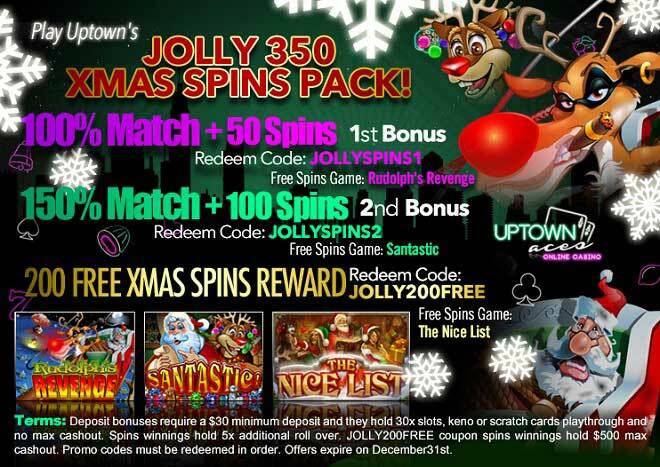 A Jolly Uptown Time With a 350 Xmas Free Spins Pack! Christmas time is here and by golly we’ll be celebrating Uptown! Let the raucous sleigh bells jingle as they bring wins with three special presents: a 100% Match, a 150% Bonus and a 350 Xmas Spins Pack! You’ll have a chance to unwrap presents every day of December when you deposit as little as $30! Collect a 1st 100% Bonus and 50 Rudolph’s Revenge Spins, continue celebrating your Christmas with a joyous 2nd 150% Match plus 100 Santastic! Spins and your tree will shine the brightest with more wins coming from a 200 Xmas Spins Reward! Begin your Christmas festivities away Uptown by depositing as low as $30! 200 Free Xmas Spins Reward! Deposit bonuses require a $30 minimum deposit and they hold 30x slots, keno or scratch cards playthrough and no max cashout. Spins winnings hold 5x additional roll over. JOLLY200FREE coupon spins winnings hold $500 max cashout. Promo codes must be redeemed in order. Offers expire on December 31st.